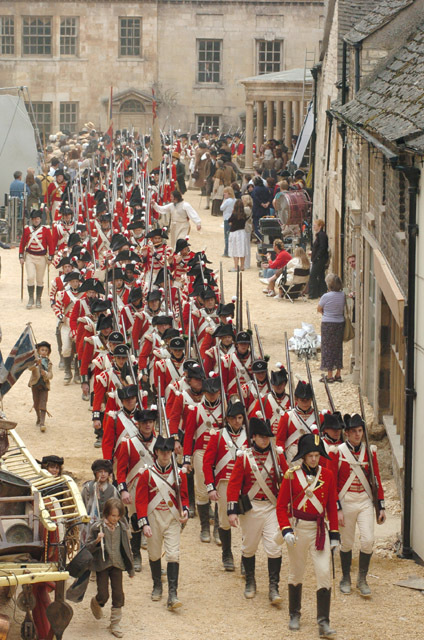 The 18th and 19th Centuries in the British Isles were marked by profound social and economic change. With increasing global trade, there were certainly fortunes to be made, but not without taking risks, and there was no effective welfare state to protect those who made the wrong choices, or who were simply unlucky. Developments in agriculture (crop rotation, the enclosure of common land, the selective breeding of livestock) meant that there were fewer livings to be had on the land: families that had tilled the soil, or herded sheep, for more than a thousand years found themselves without a livelihood. Thousands flocked to the industrial towns of Northern England and Scotland to join the growing ranks of factory workers. As the rich became richer and the poor became poorer, however, a new opportunity arose: domestic service. Rich people had always had servants, of course, but there were now more rich people in the British Isles than ever before, and, where the rich led, the middle classes followed. 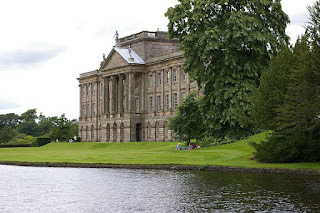 Great aristocratic houses such as Chatsworth and Longleat employed armies of male and female servants, but even people of "the middling sort," "gentle-folk" rather than aristocrats or industrialists, might now afford to keep a butler and a housekeeper, a couple of maids and a manservant. There were more subtle changes, as well. It was no longer the butler or steward who commanded the servants of a household, but rather the housekeeper; and she reported not to the man, but to the lady of the house. "As with the commander of an army, or the leader of any enterprise," wrote Isabella Beeton, in her Book of Household Management, "so it is with the mistress of a house. Her spirit will be seen through the whole establishment; and just in proportion as she performs her duties intelligently and thoroughly, so will her domestics follow her path." 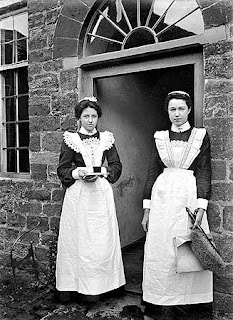 Housemaids at Byfield, Northamptonshire, late 19th or early 20th Century. Photo: Historic England, BB98106062 (reproduced with permission). The relationships between families and their servants involved a combination of intimacy and social distance that has few parallels in the modern world, but such relationships dominated people's lives for generations. Between 1750 and 1920, all the women of my mother's family were in service until they left to marry tradesmen (carpenters, blacksmiths, tailors, later railwaymen). We catch glimpses of these relationships in the novels of the time, but only fleetingly, since the servants are always in the background. In her novel, Longbourn, Jo Baker re-imagines Jane Austen's Pride and Prejudice from the servants' point of view. 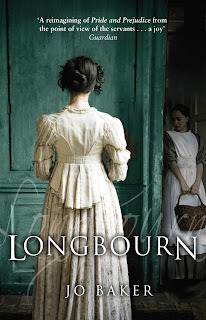 The Longbourn household, home to Mr & Mrs Bennett and their five daughters, had only five servants (Pemberley would have been a very different novel): Mr & Mrs Hill, the butler and housekeeper; two maids, Sarah and Polly; and a manservant, James. 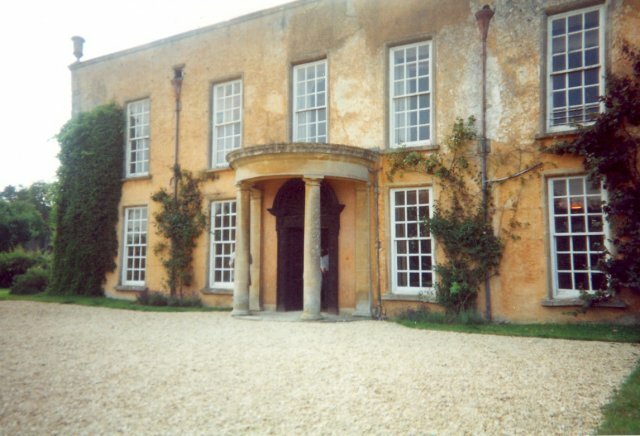 Luckington Court, Wiltshire, featured as Longbourn in Andrew Davies's 1995 television adaptation of Pride and Prejudice. Photo: Paul Ashwin (licensed under CCA). 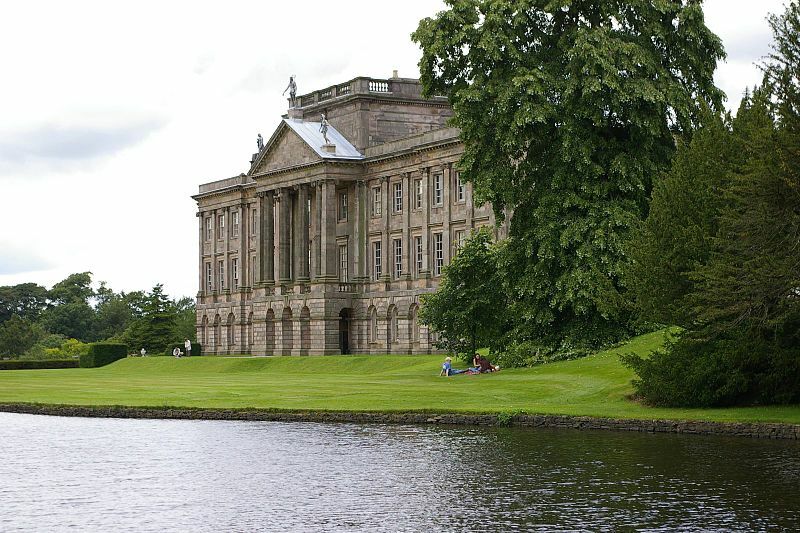 The much grander Lyme Park, Cheshire, featured in the same adaptation as Pemberley, home to Mr Darcy. Photo: Mike Colvin (licensed under CCA). 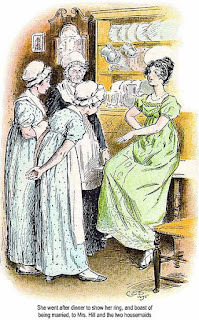 Jo Baker remains essentially true to Austen's original story, and adopts a similar narrative voice, whilst introducing several twists of her own, but gives us a wholly different perspective. "There could be no wearing of clothes without their laundering, just as surely as there could be no going without clothes, not in Hertfordshire, anyway, and not in September. Washday could not be avoided, but the weekly purification of the household's linen was, nonetheless, a dismal prospect for Sarah. The air was sharp at four thirty in the morning, when she started work. The iron pump-handle was cold, and even with her mitts on, her chilblains flared as she heaved the water up from the underground dark and into her waiting pail. A long day to be got through, and this just the very start of it." 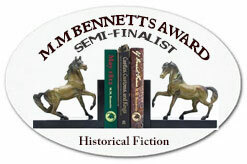 "Mr Collins must, of course, be made to see how entirely necessary the current servantry were to the future enjoyment of his inheritance: he could, if he chose to, dismiss them all with a snap of the fingers once Mr Bennett was dead, and this secure little arrangement would be peeled into its separate parts and flung to the four winds. Poor Mr Hill would die of it, that much was certain. Little Polly would fall foul of something or someone, being far too young and far too daft to fend for herself, and Sarah was simply too trusting to be out alone in the world." Lydia showing her ring to Mrs Hill and the housemaids. C.E. Brock, 1895 (image is in the Public Domain). 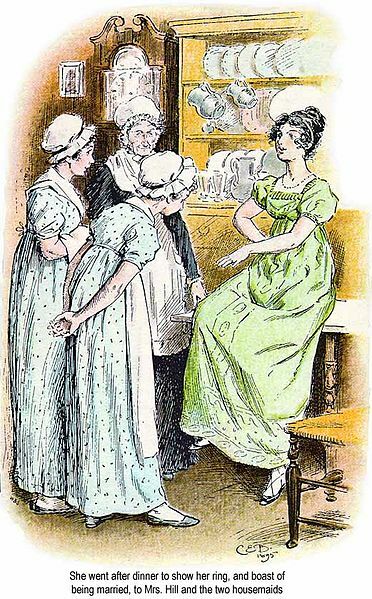 "Sarah did not know what she had expected, but clearly she had expected something, or her chest would not feel as hollow and grey as it now did ... 'When you write next to Miss Lydia, miss,' she asked Elizabeth, 'would you mind asking her, if it is not too much trouble, if there is any news of Mr Smith at Brighton?' ... Elizabeth frowned, half shook her head. 'I'm sorry. Of whom?' ... Elizabeth's expression cleared. 'Oh! Smith! You mean the footman! ... You called him Mr Smith, that's why I misunderstood you ... Well then, I shall mention it as you ask ... but I fear her thoughts are so occupied with officers that it will be unlikely she would spare much notice for a footman.'" Scene from Joe Wright's 2005 film adaptation of Pride and Prejudice, in which the town of Stamford, Lincolnshire, featured as Meryton, the Hertfordshire town closest to Longbourn. Photo: Nat Bocking (licensed under CCA). This goes well beyond what is sometimes thought of as "fan-fiction" - taken together, Austen's novel and Baker's give a fuller picture of their time and place than any single novel I can think of. Between 1660 and 1789, hundreds of young British men, and a much smaller number of young British women, undertook a rite of passage, a secular pilgrimage of sorts, travelling through Europe to see the sights of Paris, Geneva, Venice and Rome. Overseas travel of any sort was, of course, a possibility only for those with a certain level of financial means, but, whilst the wealthiest aristocrats traveled in private carriages with substantial retinues of servants, commissioning portraits from fashionable artists such as Pompeo Batoni, and buying up large collections of classical sculpture to ship home, it was possible for individuals of more modest means to travel with one or two companions, seeing the same sights, and returning, perhaps, with some volumes of Piranesi engravings, together with one's own book of sketches. The "Grand Tour" was not a uniquely British affair. Here J.W. 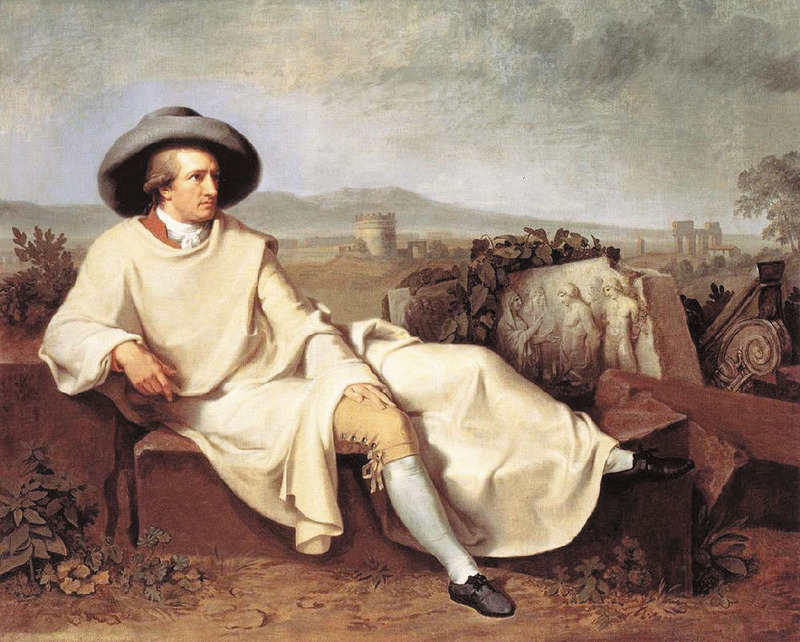 von Goethe is depicted by J.H.W. 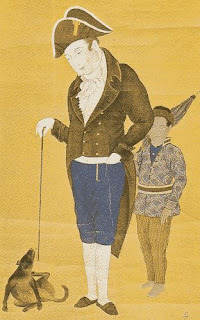 Tischbein (image is in the Public Domain), with all the attributes of a grand tourist, although, unlike most of his British contemporaries, he made the journey in his thirties, when he was already an established writer. Although this "Grand Tour" shared many of the features of a pilgrimage (it followed an established route, with opportunities to meet fellow travelers along the way, and involved shared experiences at specific places), its aims were educational rather than religious. The education was as much social as intellectual: the idea of a "British Empire" was still in the process of being defined, but it was looking (at least, to the British upper classes) increasingly like a mirror image of the Roman Empire. Ancient Rome had had three classes of free men: Patricians, who owned land and governed the empire; Equestrians, who served as officers in the army; and Plebians, who made their living by trade. Upward mobility was possible (even for a slave, who might hope to be freed, and whose free-born sons then had the status of citizens), but it involved a great deal of hard work: through commerce and wealth accumulation, if you were a Plebian aspiring to be an Equestrian; and through military service and political machinations if you were an Equestrian aspiring to be a patrician. The message of the Grand Tour was that advancement within modern Britain operated in much the same way. 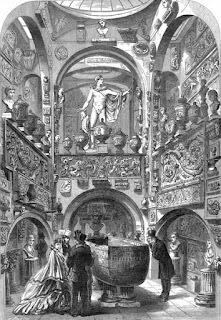 Sir John Soane's Museum, as depicted in the Illustrated London News for 1864. Some of the Greek vases in his collection may be relics of his own, relatively modest, Grand Tour, but many more were acquired by him later in life when, as a successful architect, he was able to purchase them from younger men returning with more debts than assets (an occupational hazard of the Grand Tour). The Temple family of Stowe, in Buckinghamshire, are a good example of this neo-Roman aspirational ideal. They had made their wealth, in the 16th Century, from the wool-trade. Thomas Temple purchased a knighthood from James I (a king who, on succeeding Elizabeth I, entered London in a Roman-style Triumph) in 1603 and, eight years later, upgraded it to a baronetcy (in effect, a knighthood that can be inherited). His successors took the Parliamentary side in the English Civil War, fighting with distinction in the army of Oliver Cromwell, but they quickly adapted to the new environment of the Restoration (knowing perfectly well the example of the Roman senators who transferred their allegiance from the Republic to the rule of Augustus Caesar). The Fourth Baronet was raised to the peerage in 1714. 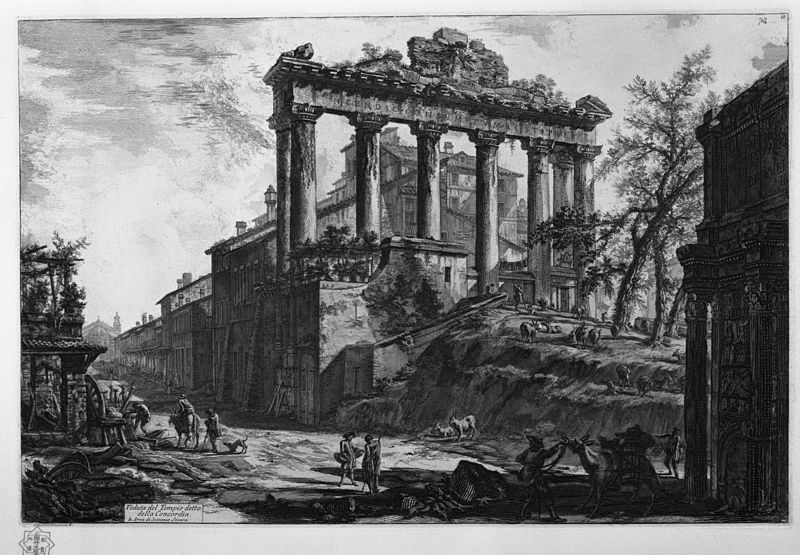 Rome itself was the primary destination of the Grand Tour. 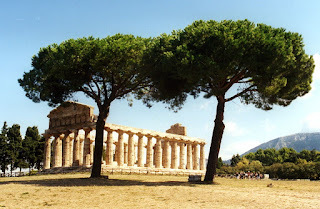 All grand tourists had an itinerary that included the Colosseum, the temples of the Forum Romanum and the Pantheon, returning home with sketches of these monuments, the architectural features of which might subsequently be used as models for their own country seats. 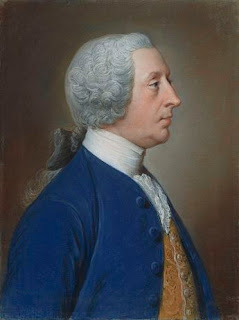 Sir William Hamilton (he who would later be cuckolded by Horatio, Lord Nelson), as British Ambassador to the Kingdom of Naples from 1764 to 1800, was a great promoter of the Grand Tour, enticing the tourists to extend their journey southwards, to the excavations at Pompeii and Herculaneum, and to Paestum, where Greek, as well as Roman, antiquities could be seen. The Temple of Saturn, in the Forum Romanum, as depicted by Giovanni Battista Piranesi (image is in the Public Domain). The Temple of Athena at Paestum. Photo: Michael Johanning (licensed under GNU). The English Banker, Henry Hoare (1705-1785) seems to have made his Grand Tour, like Goethe, when he was in his thirties, setting out in 1738, following the death of his mother. He was, by this stage, already married, with three children, so it is possible that they traveled as a family. 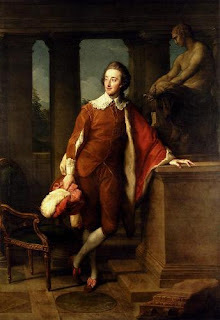 Henry Hoare, by William Hoare of Bath, The Getty Collection, 263439 (Photo: Getty Research Institute, Open Content Programme). We do not know Hoare's precise itinerary, but he seems to have been away for almost two years. On his return, inspired by the landscapes and monuments that he had seen, by artworks that he had viewed in continental collections, and by paintings that he himself owned, he set about transforming the garden that he had inherited from his parents at Stourhead, Wiltshire, into an allegory of classical antiquity, with a series of temples constructed by the builder, Henry Flitcroft. This constructed landscape served to demonstrate not only his wealth, but also his learning, taste, and refinement. The Temple of Apollo at Stourhead. Photo: Hans Bernhard (Schnobby), licensed under CCA (GFDL-CC-BY-SA). 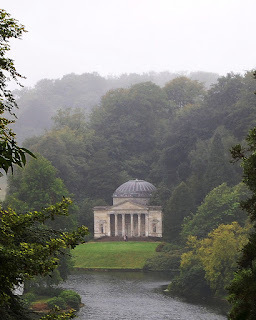 The Pantheon at Stourhead. Photo: Luke Gordon (licensed under CCA). The Temple of Flora and bridge at Stourhead. 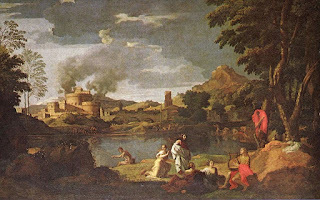 The lake itself is artificial, and the walk around it is intended to evoke Aeneas's descent into the underworld, as described by the Roman poets, Vergil and Ovid. 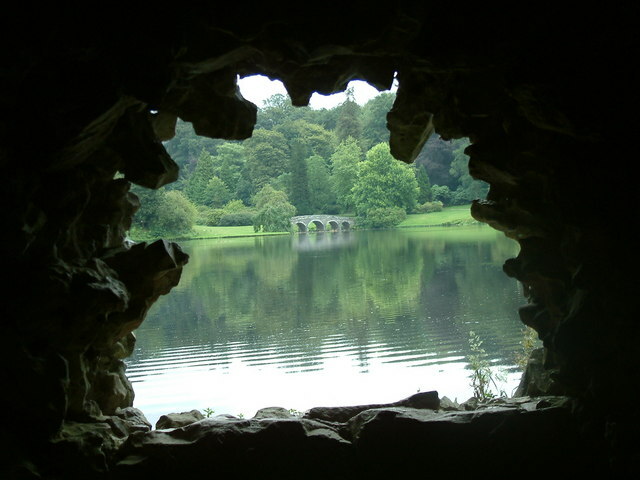 The view from the grotto at Stourhead. Grottoes are artificial caves, where the presence of mythical beings, such as nymphs, might be imagined. Photo: Neil Kennedy (licensed under CCA). 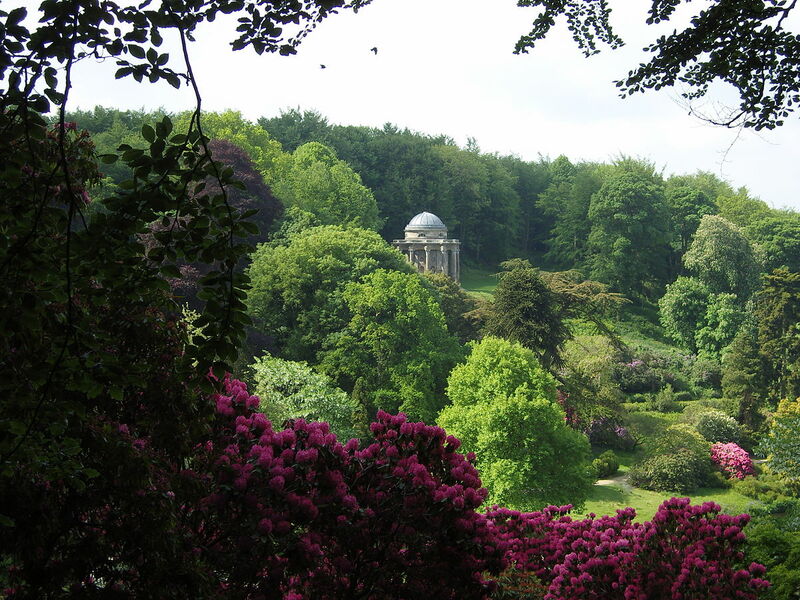 The gardens created by Hoare at Stourhead, as well as providing a lasting (if idealised) memory of his Grand Tour, are Picturesque: that is to say that they are carefully designed in such a way that specific viewpoints, such as those illustrated above, resemble the compositions of paintings, and specifically the works of artists fashionable during Hoare's lifetime: notably Claude Lorrain, Poussin, and Gaspard-Dughet. 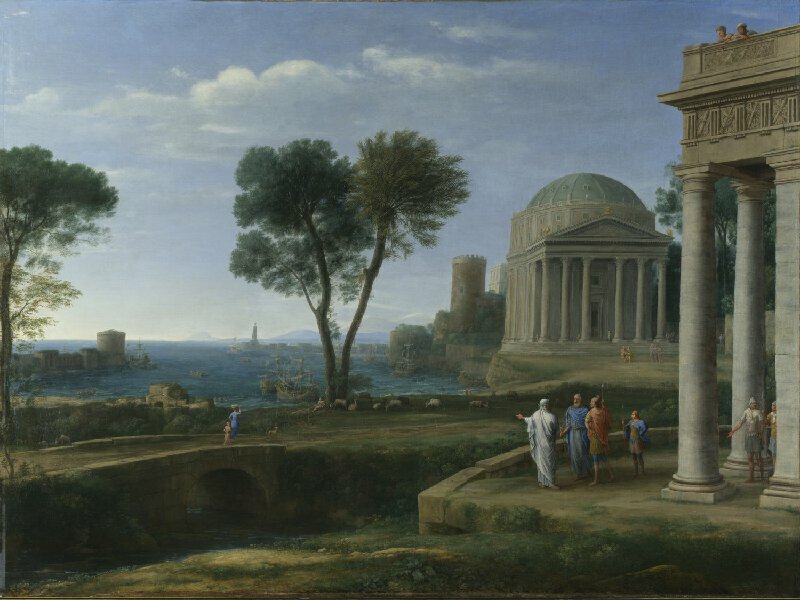 One painting that certainly influenced Hoare in the construction of his garden was Claude's "Landscape with Aeneas at Delos, which he himself owned. 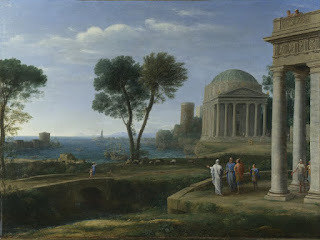 "Landscape with Aeneas at Delos," by Claude Lorrain, c 1672, National Gallery NG1018 (image is in the Public Domain). 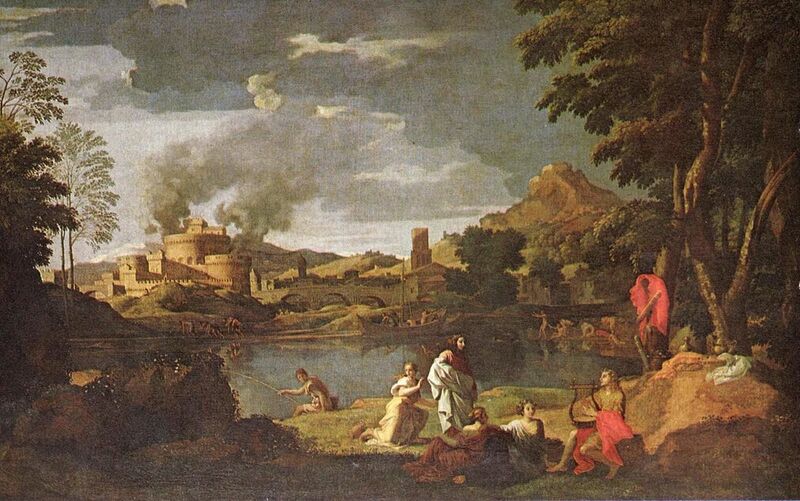 "Landscape with Orpheus and Eurydice," by Nicolas Poussin, The Louvre, 7307 (image is in the Public Domain). 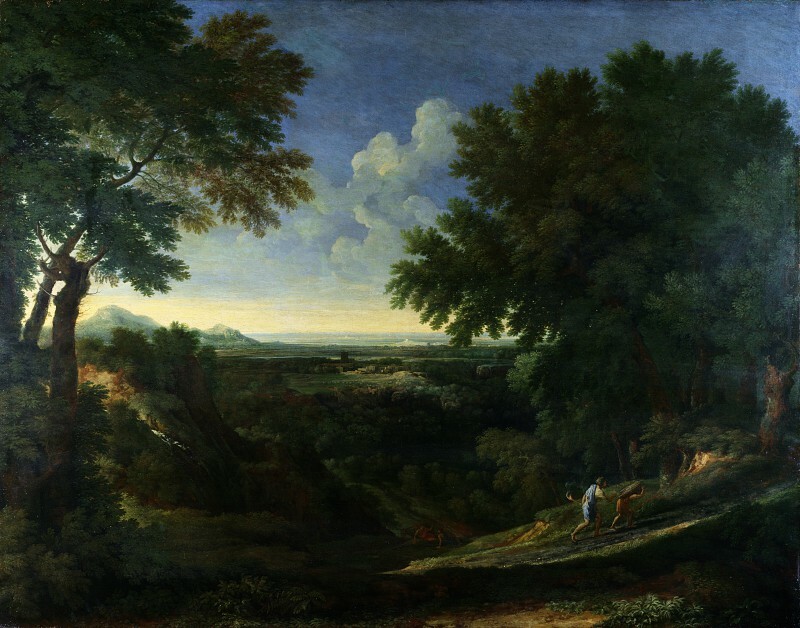 Landscape with Abraham and Isaac, by Gaspard-Dughet, c 1665, National Gallery, NG31 (image is in the Public Domain). There was even a moral dimension to the Grand Tour, the artworks that inspired it, and the landscapes that were constructed to evoke it. Just as the character of Aeneas, in Vergil's Aeneid, is defined by his epic journey from the destruction of Troy to the lands where Rome would ultimately be built, so the character of a man such as Henry Hoare was defined by his (admittedly more leisured) progress through the landscape of ruined Rome; and just as Aeneas's greatness was something to be passed on to future generations (the Emperor Augustus claimed descent from him), so a landscape such as Stourhead, with its many layers of meaning, would become part of the inheritance of Hoare's heirs and successors. The French Revolution, and, later, the Napoleonic Wars, made the Grand Tour more difficult, more dangerous and much more expensive. Lord Byron did make a Grand Tour of sorts, between 1809 and 1811, but few had his resources, or his family's naval connections, which he called upon more than once to assist him in his travels. 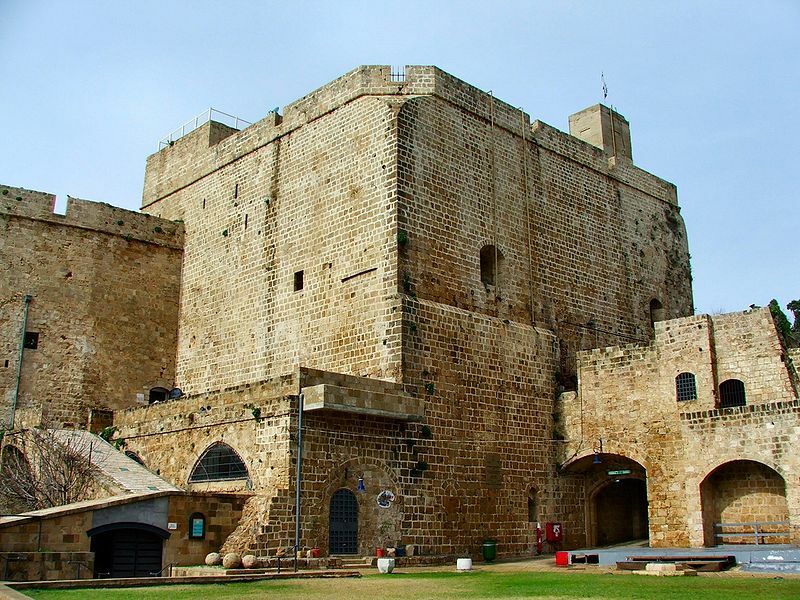 Athens, rather than Rome, was the cultural high-point of his journey, from which he did not return alive, perhaps the clearest of indications that the era of the Grand Tour, as experienced by men such as Henry Hoare, had come to an end. The wealth of the New World created new opportunities for trade within the Old World. The return on investments in sugar plantations in the Caribbean, tobacco and cotton plantations in North America, and plundered gold from Mexico and Peru increased the demand within Europe for luxury products that had long been available to those who could afford them: silks, rice and porcelain from the Far East; spices from India & Sri Lanka; as well as for more generalised commodities, including copper and silver. As ships circumnavigated the globe, new luxuries also became available to European consumers for the first time: coffee & tea; chocolate & opium. 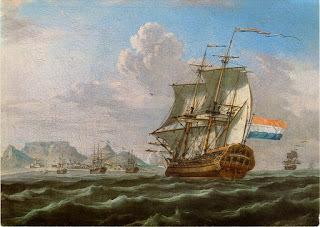 The British East India Company was established in 1600; the Dutch East India Company in 1602; the Portuguese East India Company in 1628; with competition from the French, the Swedes and the Danes. These companies had quasi-governmental powers, with their own armies and navies, and the power to negotiate treaties. China, India and Japan, however, were ancient, literate civilisations whose rulers were determined that this new trade, however lucrative, would be conducted on their own terms. 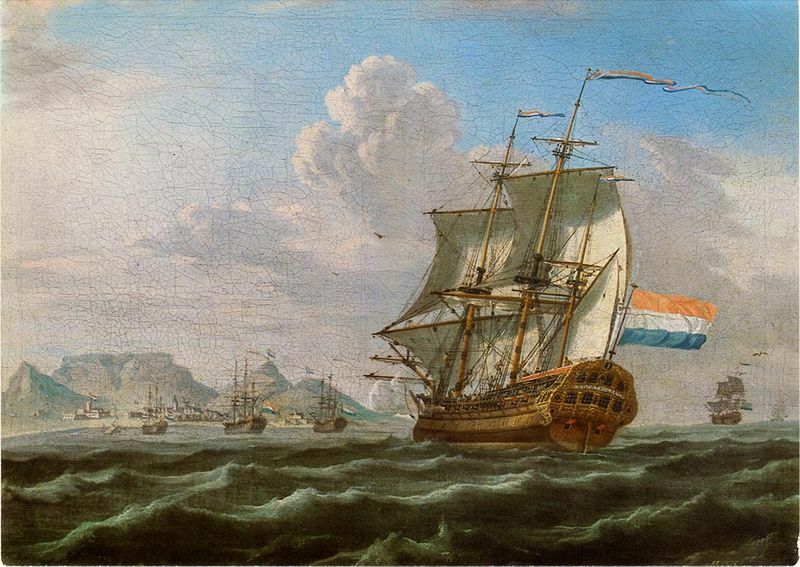 The Dutch East-Indiaman, Noord-Nieuwland, off Table Bay, 1762. Iziko William Fehr Collection (image is in the Public Domain). Specifically, China and Japan were concerned that the exchange of goods should not be accompanied by an uncontrolled exchange of ideas. Already, in the 16th Century, Jesuit missionaries had travelled throughout Asia, gaining converts to Christianity. In the 18th Century, Western notions of "free enterprise" challenged traditional oriental institutions. A compromise between European and Oriental interests was to provide "trading concessions," limited enclaves where foreign ships might dock, but where the interaction between the Europeans and the Chinese and Japanese populations could be strictly controlled. China provided concessions to several European companies at Guangzhou. 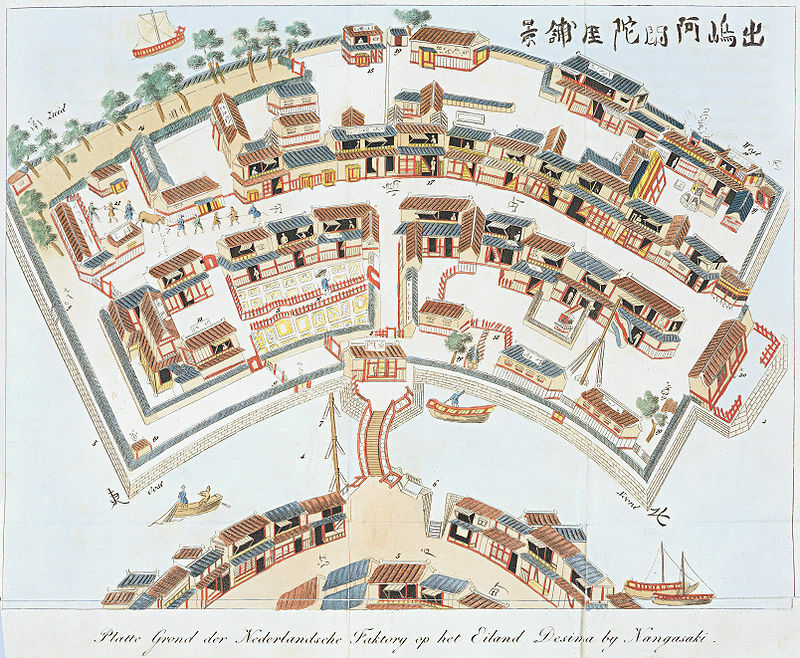 Japan created an artificial island, Dejima, granting the monopoly first to the Portuguese, and later to the Dutch. 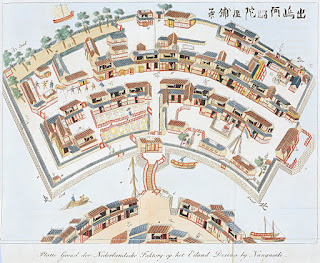 Dejima in 1825, by Isaac Titsingh, Amsterdam, Koninklijke Bibilotheek (image is in the Public Domain). Dejima and Nagasaki Bay in 1820, British Museum. Photo: PHGCOM (licensed under GNU). David Mitchell's novel, The Thousand Autumns of Jacob De Zoet, is set in the claustrophobic atmosphere of Dutch Dejima at the turn of the 18th and 19th Centuries. 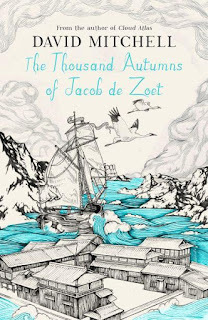 A young Dutch clerk, Jacob De Zoet, arrives, planning to make his fortune within a few years and then return to marry his childhood sweetheart. He is a conscientious employee, and part of his mission is to root out corruption, but this proves to be far more difficult than he is at first led to believe. Everyone he encounters, Dutch and Japanese alike, seems to have a finger in the pie. Everyone, that is, apart from a young midwife, Aibagawa Orito, who has, unusually, been given permission to study with the enclave's Dutch physician. Inevitably, Jacob falls in love with her, but, when her father dies, she is sent away to a Shinto convent, whose abbot casts a menacing shadow over the novel. The novel is meticulously researched, and Mitchell creates a stunning impression of a social and cultural milieu in which individuals from two very different cultures are given enough access to one another to pique, but never fully to satisfy, their curiosity. He also skilfully blurs the boundaries between historical fact and literary fiction. Jacob himself is "loosely based" on a historical figure, Hendrik Doeff, who faced down a British attack in 1808, but he is, nonetheless, a fictional character, whose confrontation with the real warship (HMS Phaeton) takes place in 1800, with a fictional captain (the latter a fantastic example of what a first-class writer can accomplish in the development of a minor character, in the space of just a few pages). Hendrik Doeff, with Balinese servant, early 19th Century (image is in the Public Domain). "The cogs and levers of time swell and buckle in the heat. In the stewed gloom, Jacob hears, almost, the sugar in its crates hissing into fused lumps. Come Auction Day, it shall be sold to the spice merchants for a pittance, or else, as well they know, it must be returned to the 'Shenandoah's hold for a profitless return voyage back to the warehouses of Batavia ... The scratch of Jacob's quill is joined by a not dissimilar noise from a rafter. It is a rhythmic scratting, soon overlain by a tiny, sawing squeak. A he-rat, the young man realises, mounting his she-rat ... "
"'The Shogun's reply to my ultimatum is a message for me,' complains Voorstenbosch. 'Why must a piece of paper rolled up in a tube spend a night at the Magistracy like a pampered guest? If it arrived yesterday evening, why wasn't it brought to me straight away?' Because, Jacob thinks, a Shogunal communique is the equivalent of a Papal edict and to deny it due ceremony would be capital treason. He keeps his mouth shut, however ,.. "
"The noises of battening, nailing and herding are gusted in through the warehouse doors. Hanzaburo stands on the threshold, watching the darkening sky. At the table, Ogawa Ozaemon is translating the Japanese version of Shipping Document 99b from the trading season of 1797, relating to a consignment of camphor crystals. Jacob records the gaping discrepancies in prices and quantities between it and its Dutch counterpart. The signature verifying the document as 'An Honest and True Record of the Consignment' is Acting-Deputy Melchior van Cleef's: the deputy's twenty-seventh falsified entry Jacob has so far uncovered. The clerk has told Vorstenbosch of this growing list, but the Chief Resident's zeal as a reformer of Dejima is dimming by the day. Vorstenbosch's metaphors have changed from 'excising the cancer of corruption' to 'best employing what tools we have to hand' ..."
I have deliberately not quoted from Chapter XXXIX, an extraordinary piece of prose-poetry, including what is, for my money, one of the most remarkable and beguiling sentences in the whole of English literature. Such writing can only truly be appreciated in the context of the work of which it forms part. 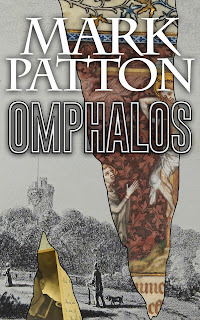 The characters in "Jerusalem," the 16th Century story in my novel, Omphalos, begin their pilgrimage to the Holy Land in Venice. 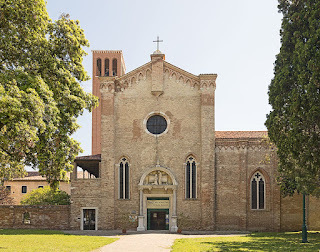 Some of them visit the Monastery of Sant'Elena, on an island in the Venice Lagoon, where they are shown the preserved body of Saint Helena (the mother of the Emperor Constantine, and supposed discoverer of the True Cross and the tomb of Christ), who appears to assist one of them in the performance of a miracle. Appearances, however, can be very deceptive. The Church of San't Elena, Venice. Photo: Didier Descouens (licensed under CCA). That someone visiting Sant'Elena in 1517 would have been shown this body is beyond doubt. The Italian priest, Pietro Casola, saw it in 1494, on his way to Jerusalem. In 1517, the English priest, Richard Torkington, making the same journey, describes what he saw in some detail: "She lith in a ffayr place of religion, of white monks, ye may see her face perfythly, her body ys covered with a cloth of whith sylke ... Also there lyes upon her breast a lytell crosse made of the holy crosse ... Also the Tumbe of Constantini Magni ... and a bone of Seynt Mary Mawdleyn." As far as I am aware, Torkington's is the last recorded account of this "relic." She seems, somehow, to have been spirited away some time shortly afterwards. I have little doubt of the reason for this: the church authorities realised that the relic was fraudulent, and did not want to stoke the fire of the Reformation with such a blatant piece of tinder. The body of Saint Helena was supposedly "translated" (the Medieval euphemism for the theft of relics) from Constantinople to Venice, by a monk named Aicardo in 1211. The problem, however, is that the body of Saint Helena was never in Constantinople in the first place. She was buried in a mausoleum on the outskirts of Rome. No Roman church today claims to hold any part of her remains, although the mausoleum can be visited, and her sarcophagus is in the Vatican Museum. 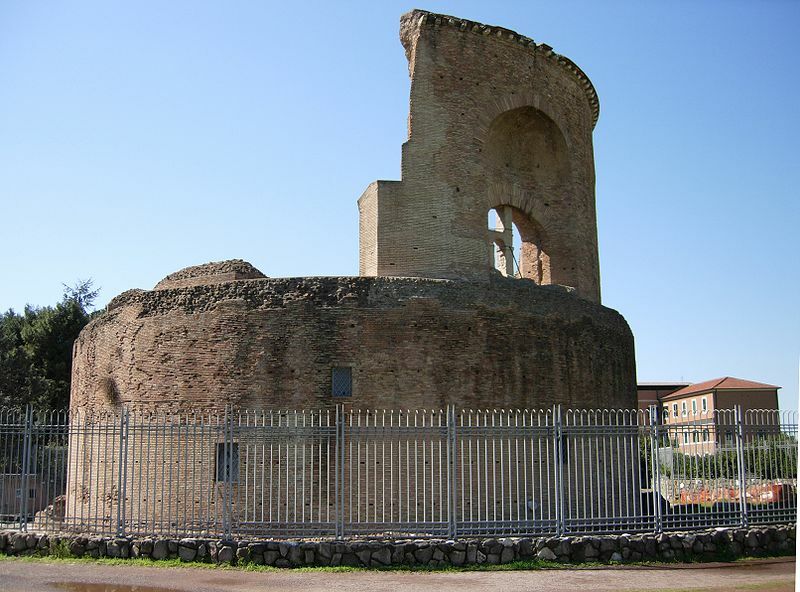 The Mausoleum of Saint Helena, Rome. Photo: Mario1952 (licensed under GNU). The Sarcophagus of Saint Helena. Photo: Joshua Sherurcij (reproduced with permission). The Monastery of Sant'Elena was closed by Napoleon Bonaparte in 1810 and, when the Church of Sant'Elena was rededicated in 1928, the "urn of Saint Helena" was returned. Clearly, however, no urn could contain what Torkington or Casola saw, a body with a preserved face, and a wooden cross lying on her breast. If no part of Saint Helena's mortal remains was ever to be found in Constantinople or Venice, and if no part of them remains in Rome, where might they have ended up? An alternative story is that they were translated from Rome to the Benedictine Abbey of Hautvillers, in the Champagne region, by a priest named Theutgise in 840 AD. This is intrinsically more believable, since he would, at least, have been looking in the right place. 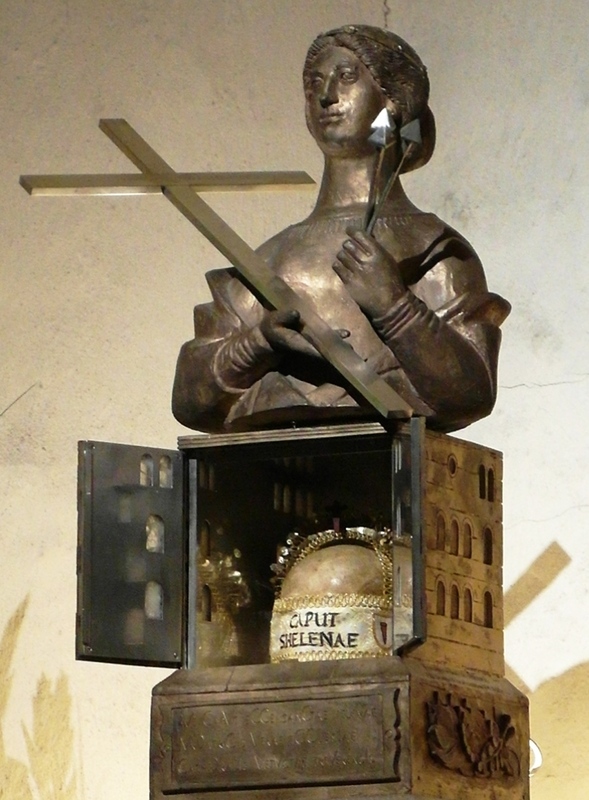 The Reliquary of Saint Helena at Hautvillers. Photo: G. Garitan (licensed under CCA). 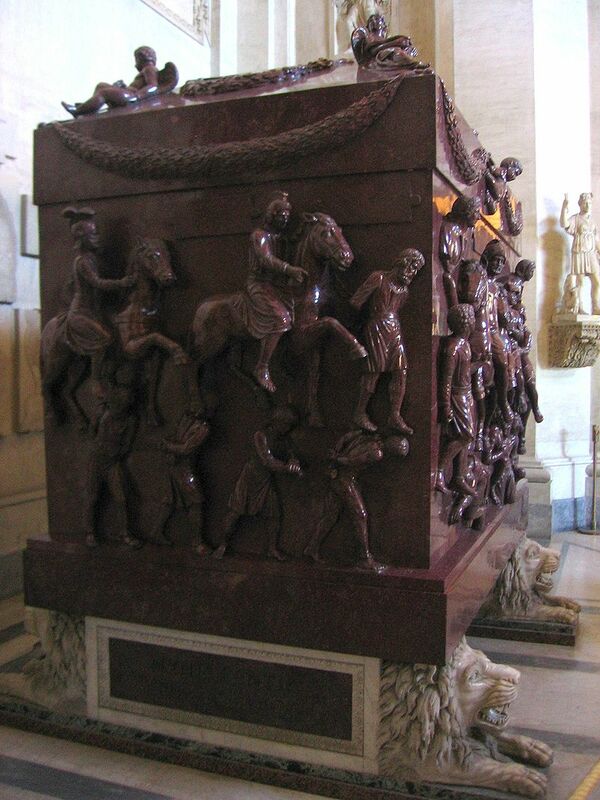 Following the Revolution, the remains were moved to Paris by the Ordre des Chevaliers du Saint Sepulcre, and installed in the Church of Saint-Leu-Saint-Gilles, on the Rue Saint Denis (in 1827, by mutual agreement, some of these remains were returned to Hautvillers). The Reliquary of Saint Helena at Paris. Photo: Testus (licensed under CCA). There are, however, other claims. Prior to the French Revolution, the Chateau de Genech, in the Pas de Calais, claimed to be in possession of Saint Helena's head. The Cathedral of Trier, in Germany, however, has a closer personal association with her (it is built on what may have been her palace, and also holds what is claimed to be the tunic of Christ, brought back by her from her journey to the Holy Land), and has a reliquary supposedly containing her skull, which it has held since the Middle Ages. The Reliquary of Saint Helena at Trier. Photo: Turelio (CCA license CC-BY-SA-3.0-de). Which, then, are the genuine relics? We can probably discount Genech, as well as Venice, but it is possible that the relics at Hautvillers, Paris and Trier are all genuine. It is equally possible that none of them are. This is just one example of a more general problem. By the 12th Century, Europe was awash with shrines and relics. That some of these were genuine we need not doubt, but that some were fraudulent was not a new discovery by the 16th Century advocates of the Reformation: it was recognised by Geoffrey Chaucer in his characterisation of the "Pardoner." The Pardoner, from the Ellesmere Manuscript of The Canterbury Tales (image is in the Public Domain). "He had a croys of latoun ful of stones. And in a glas he hadde pigges bones. But with thise relikes, whan that he fond a povre persoun dwellyng upon lond, upon a day he gat him moore moneye than that the person gat in monthes tweye ... "
Clearly some relics have more reliable "biographies" than others but, by the time the monks of Venice shuffled their false relic into an unmarked grave, the cult of relics was rapidly falling into disrepute. 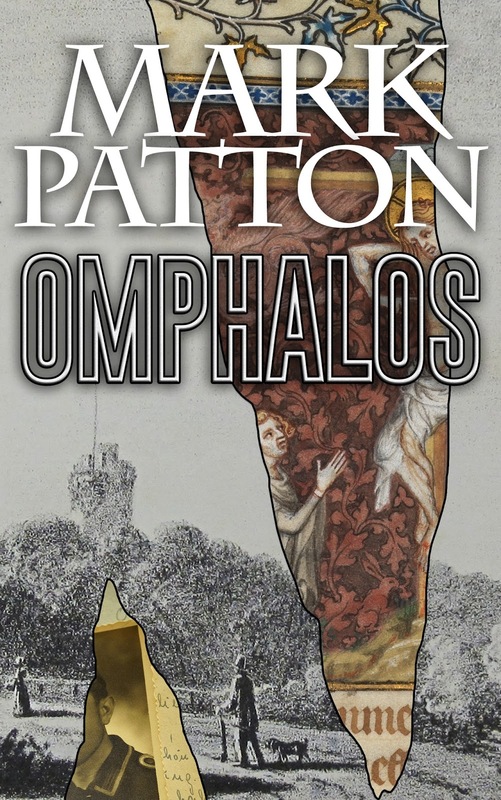 Mark Patton's novels, Undreamed Shores, An Accidental King and Omphalos, are published by Crooked Cat Publications, and can be purchased from Amazon. For this week only, the e-book versions are available at the reduced price of 99 pence/ 99 cents. Jehent daz diz ir erbe si. Durch die sine Namen dri. Wir sin an der rehten ger. Reht ist daz er uns gewer." Claim it as a legacy. Ours the only just demand. He will have us rule the land." Heinrich von Dessau is a fictional character, but any German pilgrim singing the song in 1517 would have understood that it was already ancient. It was written by Walther von der Vogelweide (1170-1230), a prolific author of both love-lyrics and martial poetry, but this song, "Palestinalied," is the only one for which we have the original music as well as the words. 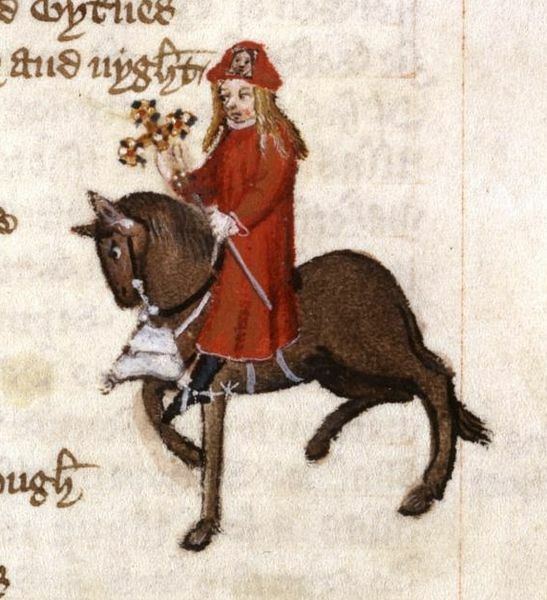 Walther von der Vogelweide, as depicted in the Codex Manesse (1305-15), University Library, Heidelberg (image is in the Public Domain). Walther was born, almost certainly, in what is now Austria. 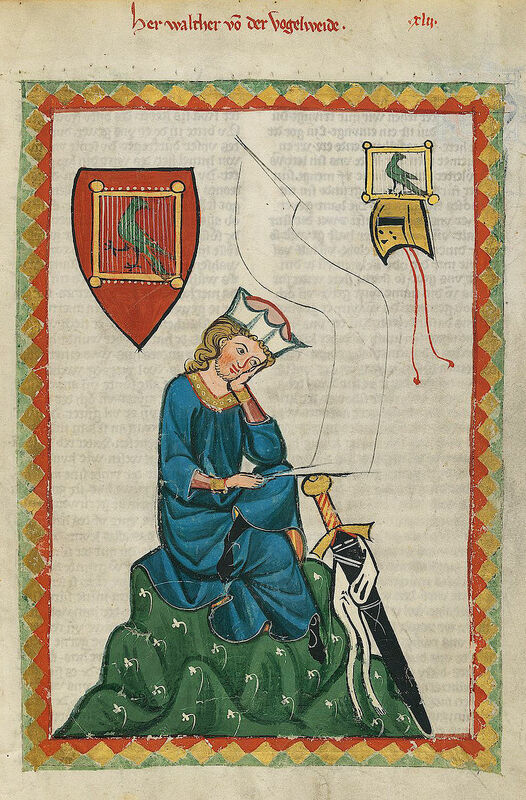 His armorial bearings suggest that he was a knight, but probably not a landed or wealthy one ("Vogelweide" refers to fields in which singing birds, and hawks for hunting, were captured, hence the main device on his shield). The helmet and sword suggest that he was knighted for military service. 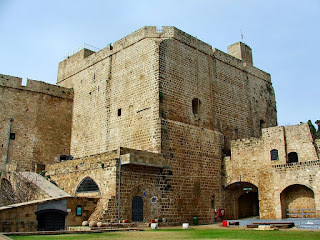 "Palastinalied" may have been written to drum up support for the Fifth Crusade (1213-21), which would end in failure on the Nile, but it is unlikely that the poet took part in this campaign, since, at 43, he would almost certainly have been considered to be beyond military age. It is, to my mind, rather more likely that he participated in the Third Crusade (1189-92), setting out at the age of 19, in the retinue of Leopold V of Austria. Leopold's overlord, the Holy Roman Emperor, Frederick Barbarossa, was accidentally drowned in a river in Anatolia on 10th June, 1190, and many of the German knights, struck by grief, returned home. 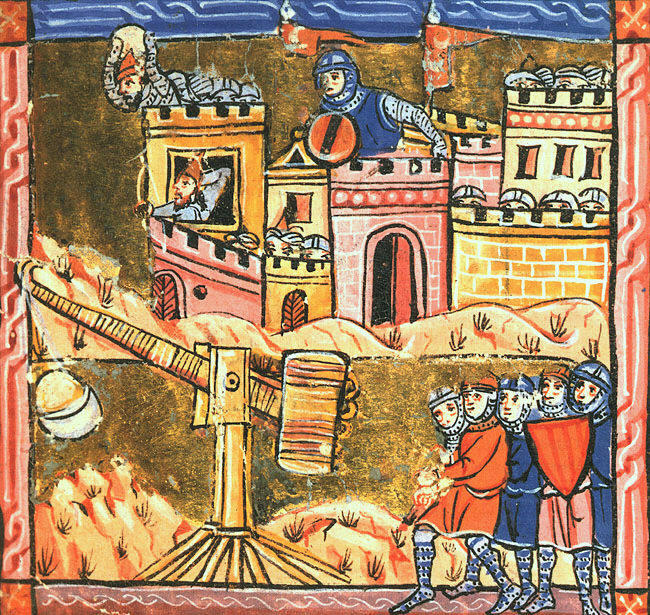 Leopold, however, continued on to the Holy Land, seizing Acre (but not Jerusalem) from the Muslims. I think it likely that Walther remained with his army. 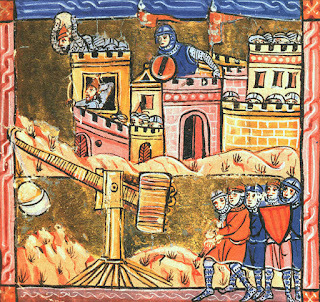 The Siege of Acre, during the Third Crusade (image is in the Public Domain). Whose renown is often told. Which, in human form, He trod" (translation as above). The old city of Acre, where Walther might have stepped, for the first time, onto the shore of the Holy Land. Photo: Maksim (image is in the Public Domain). 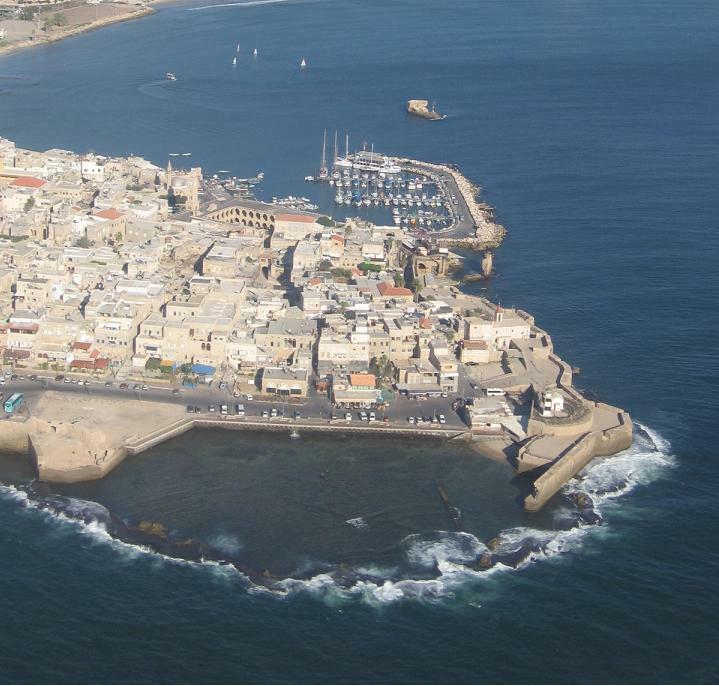 The Medieval fortess of Acre. Photo: CristianChirita (licensed under GNU). It may have been in the course of this campaign that the young Walther first met Reinmar of Hagenau, a celebrated singer and poet, known as "The Nightingale," who seems to have participated in it. Returning to Austria, Walther seems to have become Reinmar's pupil, and later served himself as a musician at the courts of Carinthia, Meissen and Brunswick. Walther von der Vogelweide's reputation, like that of his master, endured: Walter von Stolzing, the hero of Wagner's opera, Die Meistersinger von Nurnberg, claims him as a model. The "Sangerkrieg" of Wartburg, in which Walther participated, and which inspired Wagner's opera. 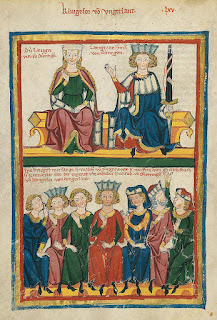 Codex Manesse, University Library, Heidelberg (image is in the Public Domain). Although a pious Catholic, Walther consistently supported the Holy Roman Empire against what he saw as the impositions and excesses of a frequently hostile papacy. Why, one might ask? Frederick Barbarossa was, perhaps, the greatest of all the Holy Roman Emperors after Charlemagne. It is hardly likely that Walther would have met him, but he might well have seen him, and even heard him speak, and perhaps his example provided the young poet and songwriter with an ideal to pursue throughout his life. 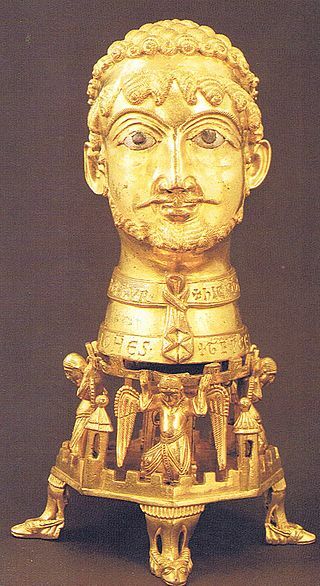 Reliquary bust of Frederick Barbarossa, Cappenberg Abbey, Germany. Photo: Dr Hans Chr. Rieldelbauch (licensed under CCA).